There's just something about flavored treats that really gets our Java pup going. I don't know if it's because she can smell them as soon as we pull them out of the bag, or the flavor of it when she gets her reward. Either way it's fun seeing her get so excited over the idea of getting a tasty treat. The nice thing about Bil-Jac treats is they are nice and small so they fit perfectly in her reward toys. They are a great way to keep her entertained, and she gives her self the reward when she gets them to fall out of the toy from playing with it. About the brand: Bil-Jac, offers a full line of nutritional super premium dog foods and treats, and is committed to feeding dogs at every stage of life, which makes Bil-Jac the one complete dog food that is for all dogs, throughout their entire life. Your dog’s food and health is not only our business – it’s our passion. More real chicken meat is put into every bag. In fact, 12 lbs. of real chicken is used to make a 15 lb. bag of Bil-Jac Super Premium Dog Food. 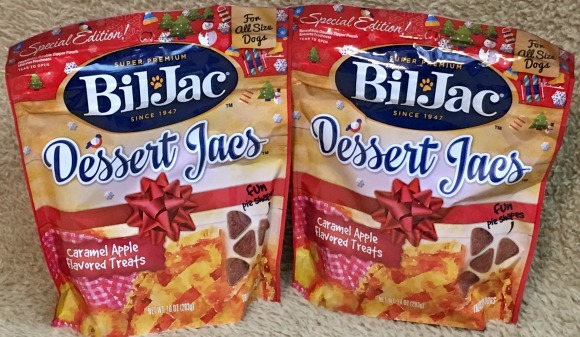 Bil-Jac Treats offer a treat alternative in a smaller size convenient for dog training or rewarding smaller dogs. Furthermore, Bil-Jac provides resources for puppies in training, health tips, puppy food and answers to dog related questions for owners.